In gemology, color is divided into three components: hue, saturation, and tone. Emerald has colors ranging from yellow to green to blue green, with primary colors of course green. Yellow and blue are normal secondary colors found in emeralds. This light glittering gemstone is known as the green beryl species. The best emerald color is about 75% of the tone on a scale where 0% tones are colorless and 100% are black opaque. In addition, emerald with a clean, smooth color will saturate and have a bright hue (life). Gray is a modifier of normal saturation or mask found on emerald; The grayish green hue is a dull green hue which is of poor quality in the color of emerald. The most desirable emerald color is bluish green to pure green, with bright color saturation and a tone that is not too dark. The most valuable emeralds are very transparent. Their color is evenly distributed, with no visible zone of color. If the color is too yellow or too bluish, the stone is not emerald, but beryls vary, and the value drops accordingly. 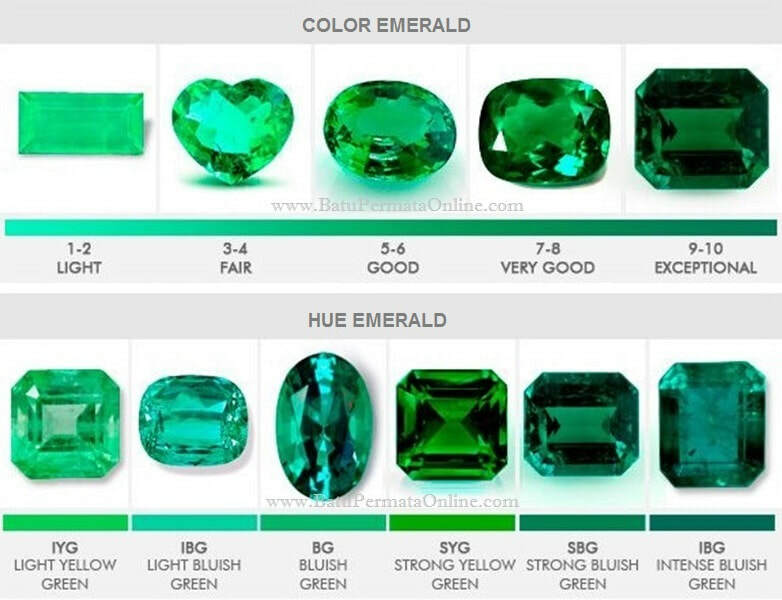 The green intensity in the best emerald may not be the same as the others. Chromium, vanadium and iron are trace elements that cause color to the emerald. The presence or absence of each and its relative number determine the exact color of the emerald crystal. Emerald appearance is sometimes associated with the mine location. Colombian emerald is said to have a pure green color that is warm and more intense. 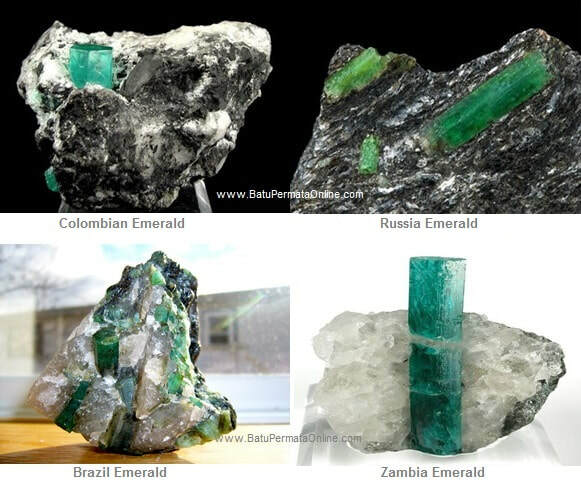 Zambian emerald is said to have a green color that is cooler and more bluish. Brazilian emerald has the color of green grass from beryl minerals), in the quartz-pegmatite matrix with hexagonal crystals and distinctive prismatics. Even though emeralds are green, they actually range from yellow-green to blue-green. Gray color is defined based on three aspects: hue (color), saturation (intensity), and tone (purity). The clearer green, the darker and purer it shows, the more valuable the emerald. Very light emerald is actually classified as green beryl, while the emerald to the dark receives the prestigious title of emerald. The best emerald is that has a level of 75% tone, where 0% is a transparent stone and 100% will be opaque black. Between color and clarity, which has a greater impact on the price and value of gemstones? Well, color is the main value factor, but it's not always the most important. For example, if there are two emeralds with dark, bright green coloring that is exactly the same, and one transparent, while the other is translucent, the transparent one might be worth $ 10,000 per carat, while the translucent will be worth several times less. Thus, transparency will be the main factor that contributes to lower values. Similarly, lighter middle emerald green with good clarity can be more desirable even though they are priced lower than deep green. This does not mean that clarity is more important than color. It only shows that the importance of each gradation factor varies from stone to stone. There is just not a single factor that will always determine the quality and thus the value of colored gemstones. One must always judge the gemstone according to the attraction that certain stones have on your personal preferences, and on the overall balance and synergy of all color factors, clarity, transparency and pieces of stone. How do stones attract your eyes? That is the most important factor.